This is a very good place to stop for refreshments. In 2005 it had a good variety of food on the menu at very reasonable prices. There was also several good beers on draught at prices that were good value for money. Not one to miss out on a marketing opportunity, the Grouse Inn has the logo "The Infamous Grouse". 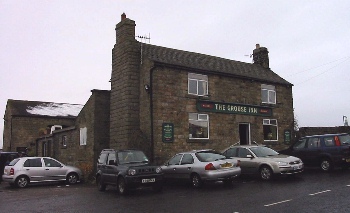 The Grouse Inn was last inspected on a Monday lunchtime in November 2005. The menu was varied and the service good. The food was of a good standard and the staff were pleasant and friendly. There was a good range of beers and it was well kept. In addition, the pub was selling a series of leaflets titled "Walks Around the Grouse Inn". Each one costs £1 and the proceeds go to the local rescue team. The menu was varied and the service good despite the pub being full. The food was of a good standard and was good value for money. There was a good range of well kept beers at prices that were good value for money. This information is provided to the best of our knowledge. We have collected and collated it in good faith but we are not responsible for its accuracy and anyone intending to make use of this information is advised to check it out. Well that's the legal stuff sorted. Should you decline to comply with this warning, a leather winged demon of the night will soar from the deep malevolent caverns of the white peak into the shadowy moonlit sky and, with a thirst for blood on its salivating fangs, search the very threads of time for the throbbing of your heartbeat. Just thought you'd want to know that. © copyright 1991, 2019 HCI Data Ltd. and HCI Data Ltd.